The second long player of experimental sounds by John Lennon and Yoko Ono, Unfinished Music No 2: Life With The Lions was released on the Zapple label in May 1969. The follow-up to Unfinished Music No 1: Two Virgins continued the couple's attempt to present their lives together as artistic statements. The first half was an avant-garde jazz performance recorded live at Cambridge University, while the second documented their stay in London's Queen Charlotte Hospital in 1968. The album was the first to be released on The Beatles' label Zapple, intended as an experimental counterpart to Apple. It was issued on the same day as George Harrison's Electronic Sound. Cambridge 1969 was a 26-minute piece featuring Ono on wailing vocals and Lennon coaxing numerous shades of feedback from his guitar amplifier, recorded on 2 March 1969. For the final six minutes they were joined by saxophonist John Tchicai and percussionist John Stevens, who continued playing for a time after Lennon and Ono left the stage. The album's second half was recorded after Ono was admitted to hospital on 4 November 1968. 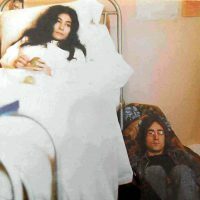 During her stay Lennon remained at her side, sleeping in a spare hospital bed until it was needed for another patient; he subsequently slept on the floor. Over the next fortnight they made a series of recordings. No Bed For Beatle consisted mostly of Ono singing snippets of press articles about the couple, with Lennon doing the same in the background. The track is followed by Baby's Heartbeat, a five-minute audio recording of the couple's unborn child. On 21 November 1968 Ono suffered a miscarriage, which was attributed to stress caused by the couple's recent arrest for drugs possession and the backlash they received from the media. The child was named John Ono Lennon II, and was later buried in a secret location. Two Minutes Silence follows; its contents are self-explanatory. Interestingly, in 1973 the couple released another silent track, Nutopian International Anthem on the Mind Games album, which followed their announcement of Nutopia, a conceptual country. The final track on Life With The Lions is Radio Play, more than 12 minutes of a radio being turned on and off by Ono. Lennon can be heard in the background speaking on the telephone, and at one point The Beatles' Ob-La-Di, Ob-La-Da can be heard. A 1997 compact disc reissue included to additional recordings made at Queen Charlotte Hospital. Song For John is a relatively conventional song featuring Ono singing over Lennon's acoustic guitar backing, while Mulberry has Lennon on slide guitar while Ono repeats the title word for nine minutes. Lennon and Ono appeared on The David Frost Show in London on 14 June 1969, in which they talked about Unfinished Music No 2: Life With The Lions, as well as their peace campaigns. A must-have for all Lennon die-hard fans, but definitely the least appealing! Apart from the gregorian reading of newspapers articles concerning them both ( John & Yoko ) , the rest is painful to the ear , somewhere between Lou Reed ‘s Metal machine music and the stooges LA blues. Embarassing! I wish Lennon would have began his solo career with legitimate albums of music, instead of wasting his talent on three avant-garde releases. I reckon these albums are “exhibit A” for why so many fans hated Yoko and considered her to be the reason the Beatles broke up. That said, Life with the Lions is an improvement over Two Virgins. I found Two Virgins to be a dull and boring affair from start to finish. I have yet to hear the Wedding Album. “Baby’s Heartbeat” is the track I found most provocative. Not that it’s any masterpiece from John, but it’s actually quite macabre in its own way. That sound of a dead baby’s heart going on for five minutes is scary and sad. I like how the track abruptly ends, followed by two minutes silence. John & Yoko’s pain comes through loud and clear!